SMO stands for social media optimization and sites used for SMO are known as SMO sites . 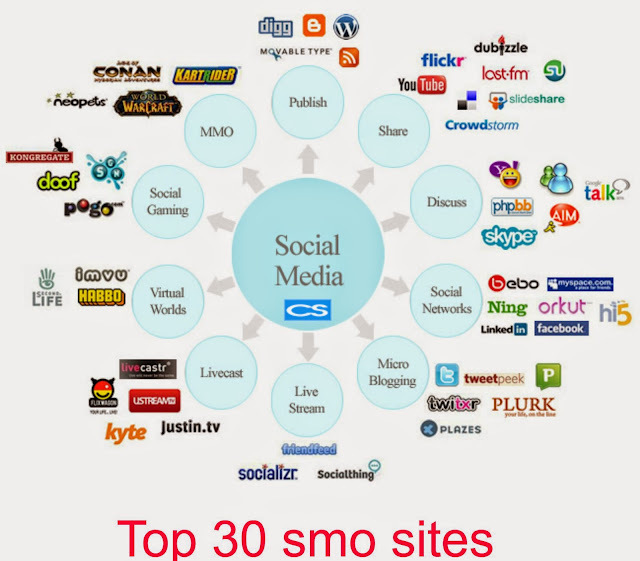 Here in this post I am giving you free and top 30 SMO sites list for 2015 . I already gave a review on best and top 10 social media sites for best optimization. These sites are free and you don't need to pay anything for using it. 1. Facebook.com : The best social media optimization site with millions of active users. You can get high quality traffic and no follow backlinks from Facebook. 2: Twitter - The best social media site for professionals , you can share your messages publicly with 140 character limit . Its a good way of getting pr 10 backlink . 3. Digg : It is a social bookmarking site and currently very popular in social media optimization field. 4.Stumble - It is the best collection of cool websites and hence it is best social bookmarking website for new users. 5 . LinkedIn - IT is a social network for corporate world and job seekers. 6. Traffup.net - IT is a website traffic exchange site. It offer a points system in which we get points on seeing other's website and redeem points when other visit our site . 7. Reddit - It is another good SMO site but as not good as StumbleUpon . But for traffic purpose it is good choice. 8. Hubpages - Gives traffic along with backlinks to your site . 9. Ycombinator: Good for getting backlinks . 10: YouTube - Create some viral and attractive videos and give a link to your website and get high PageRank backlinks with descent traffic . Every day, individuals who are new to SEO need to learn the basics of .... So go get your hands dirty and dive into your first get backlinks analysis. you have done the great job. Thanks for sharing these list... Most of the sites are expired and couldn't able to open. Please update them. these are the best site For smo pls go on these sites for better smo ! the best top sites in the seo. thank you for your feedback its great job by you people. That's really very helpful. Great list. Superb list you've have shared here. I really liked it very much and will surely work on it.